ACToday is the first Columbia World Project. It aims to combat hunger by increasing climate knowledge in six countries that are particularly dependent on agriculture and vulnerable to the effects of climate variability and change: Bangladesh, Colombia, Ethiopia, Guatemala, Senegal and Vietnam. The ACToday project addresses the climate threats to food and nutrition in six countries in Africa, Latin America and South Asia. 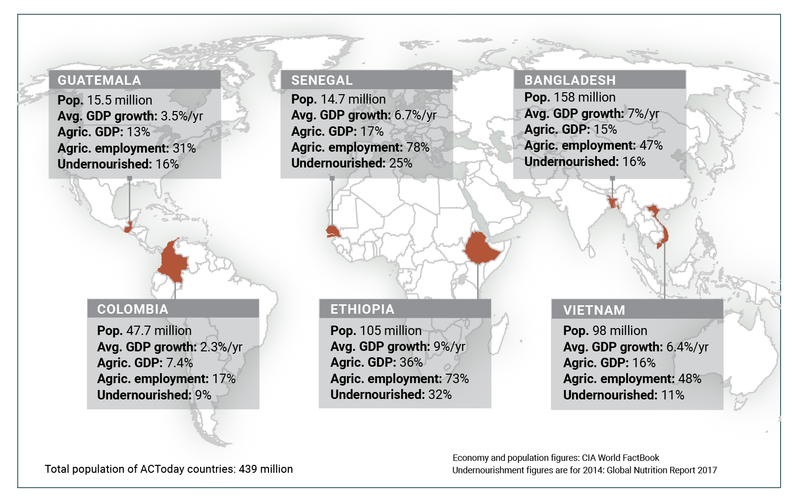 One in nine people on the planet go hungry for extended periods every year. Most are farmers and their children. The causes of hunger are well understood and predictable. Repeated cycles of hunger, and its nutritional impacts, cause large-scale disruptions. For example, 315,000 women die each year in childbirth due to low iron levels. The impacts of hunger are long-lasting and can even be multi-generational. Understanding how climate matters is key. Governments, development agencies and nongovernmental organizations have made considerable investments to improve crop yields of small-holder farmers and support resilient and sustainable development. Such programs are often implemented with little understanding about whether the proposed strategy may actually make farmers more vulnerable to climate. Good climate adaptation projects need to consider a range of time scales; however, many projects often use data directly from end-of-century global climate models without considering if those longterm simulations adequately capture what farmers might face over the next several growing seasons. Understanding existing national policies and practices is also essential. 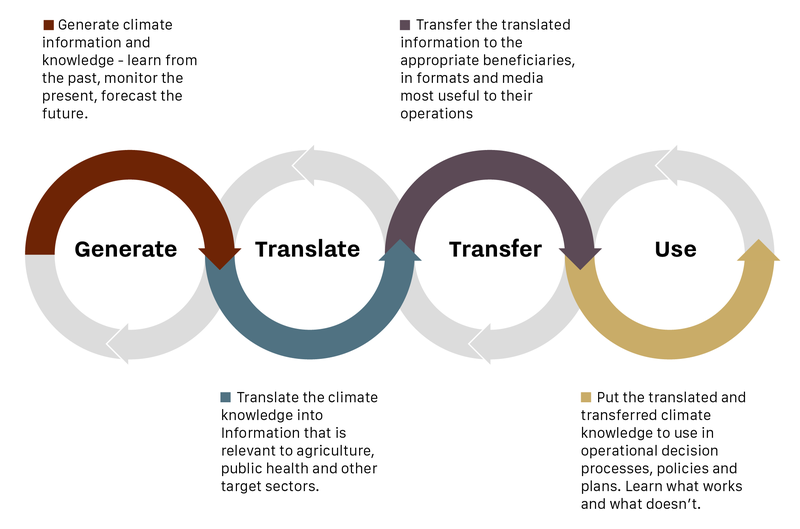 In order to create the availability and use of the best possible climate information at relevant time scales to support decision making, we first need to understand the decision options and processes. These include farming practices, political landscapes, national markets and trade policies, responsible institutions’ technical capacity, as well as the relationships between institutions. Create climate service solutions to end hunger, achieve food security, improve nutrition, and promote sustainable agriculture. Embed the best possible climate knowledge and services in the agendas and programs of the SDG2-relevant national institutions and key development partners. Work with partners to identify measurable impact and evidence of utility of climate services in food system risk reduction and the benefit this has on SDG2 outcomes. Scale best practices to all countries identified by global partners as particularly in need. Columbia’s intellectual leadership applied to programs of global impact. ACToday is addressing these issues by partnering with leading external, international organizations that have already initiated very ambitious and important programs around the world to target food security, nutrition and sustainable food systems. We’re bringing in contributions from fields in which Columbia University is a recognized leader, offering access to disciplines such as climate, anthropology, nutrition, economics and human behavior. A focus on science that informs and affects planning and decision making in a real-world setting. Through our partner networks, we plan to use our innovations in climate information, targeted through social science, economics, health, agriculture and other research, to improve local decisions. We want to improve the performance of the entire food system; for example, helping maximize production and reduce losses, improving prediction and management of flood and drought risks, enabling better financial practices and pinpointing needed relief efforts better and earlier when hunger does occur. Addressing data challenges is a critical first step to success. Many countries have significant gaps in their historical weather and climate records. Sometimes extensive data exists but it is unavailable to use because it is not digitized, or because of national data sharing policies. Historical climate data help us understand natural climate cycles and their effect on food systems, human health and water supplies. High-quality climate data allow us to see how climate varies in one place season-to-season, and over years and decades, and how common severe droughts and other events have been. If observational records are incomplete, climate forecasts and projections are likely to be less skillful. IRI is already overcoming such challenges in Africa, for example, through its Enhancing National Climate Services initiative (ENACTS). The four pillars of climate services, and the expertise needed with regard to the ACToday project. Click to see larger version. We are working with national meteorological services to create new, quality-controlled data sets and improve their access and use. This provides the foundation to do the sector work proposed by ACToday, and it brings in partners we have already engaged. Twenty years of delivering climate services. 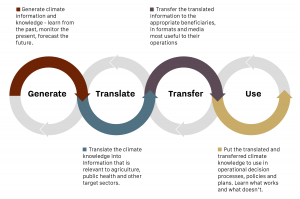 IRI stands out in its ability to provide decision makers with relevant, high-skill climate information on shorter and longer time scales, through the generation, translation, transfer and use of climate knowledge. Our forecasts are used regularly by organizations such as the Red Cross, World Food Program, Food and Agriculture Organization, World Bank’s Global Facility for Disaster Reduction and Recovery and the World Health Organization. Over the past 20 years, IRI has earned a reputation as a reliable and trusted partner in dozens of countries. ACToday employs IRI’s expertise in communication, capacity building and training to ensure in-country partners will be able to produce, distribute and use the climate information and decision-support systems after the project ends. Built-in impact evaluation. We are designing an evaluation that sets out metrics of success ahead of the project and monitors them throughout, so we can know how well our efforts are working.